These notes are organized by chapter and presented in the format of: page number, quote, source. 2, "If a book reveals," Ezra Pound, "I Gather the Limbs of Osiris," in Selected Prose, 1909–1965, ed. William Cookson (New York: New Directions, 1973), p. 30. 3, "dunes are very like slow-motion waves," Herbert, outline for an unpublished article on sand dunes. Available in the Special Collections Dept. of the Library of the California State University at Fullerton (hereafter referred to as "Fullerton"). 5, "I had this theory," Herbert, a brief reminiscence written as liner notes for Dune: The Banquet Scene, Read by the Author (New York: Caedmon Records, 1977 ). 5, "In some people," Unpublished letter from Herbert to Damon Knight, January 9, 1965. Available at Fullerton. 6, "The reward of investigating," "Crisis," p. 80. 7, "consensus reality," The concepts in the following paragraph are taken from Herbert's "Introduction" to The Wounded Planet, ed. Roger Elwood and Virginia Kidd (New York: Bantam Books, 1974). 8, "If I'd been born in," Unpublished interview by Timothy O'Reilly, New York City, Feb. 27, 1978. All interviews cited hereafter are by O'Reilly unless otherwise specified. 8, "Science-fiction is the only area," Samuel R. Delany, The Jewel-Hinged Jaw (New York: Berkley Publishing, 1977), p. 178. 8, "to create marvelous analogues," Author's telephone interview, May 28, 1979. 8, "if you want to get anything across," Ibid. 9, "pot of message," Herbert likes to play on words. This particular phrase of which he is fond appears in a number of his essays, as well as, in his conversation. 9, "a spectator society," Author's interview, Boston, Mass., Feb. 18, 1979. 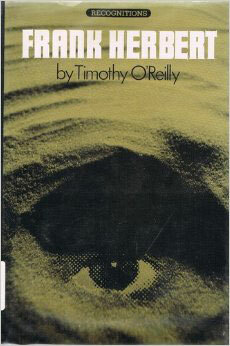 9, "the color yellow is present," For examples, see Dune (New York: Berkley Publishing Co., 1977), pp. 5, 300, 447, 452, 464, 465; Dune Messiah (New York: Berkley Publishing Corp., 1975), pp. 186, 225; Children of Dune (New York: Berkley Publishing Corp., 1977), pp. 7, 79, 332. 9, "By the time," Author's interview, Feb. 18, 1979. 10, "I treat the reader's eye," Ibid. 13, "loading the computer," Author's interview, Feb. 18, 1979. 13, "the verisimilitude of the surround," Ibid. 13, "asked him 'to be its wine writer'," Author's interview, Feb. 27, 1978. 13, "secondary careers," The list is taken from the biographical summary included in the Berkley editions of his books. 13, "He applied for a job," The following account is based on an unpublished interview by Ted Jennings, Boston, Mass., Feb. 19, 1978. 14, "I'm a muckraker," "Guest of Honor" speech, Bostone XVI Science Fiction Convention, Boston, Mass., Feb. 18, 1979. 14, "I ask myself," Author's interview, Feb. 18, 1979. 14, "Neither Brave New World," "Crisis," p. 71. 14, "He remembers," Author's interview, Feb. 27, 1978. 14-15, "Sufficiently lightly populated," Ibid. 15, "In the city," Ibid. 15, "ecological demonstration project," Herbert's farm is described in "The Herbert Homestead," by Burt Webb, in Seriatim: The Journal of Ecotopia, pp. 89–92; in "Forecasts of an Inventor of the Future" by Carolyn Drewes, San Francisco Examiner, and Herbert, "New Lifestyle to Fit a World of Shortages," San Francisco Examiner. 15, "I think the sky," Herbert, "Overview." San Francisco Examiner. 15, "One of the most beautiful things," Author's interview, Feb. 19, 1979. 16, "His greatest fear," Drewes, "Forecasts of an Inventor of the Future." 16, "Science fiction is to mainstream," Ibid. 16, "jazz performance," Author's interview, Feb. 27, 1978. 16, "You do things," Ibid. 16, "A local reporter," Author's telephone interview, June 21,1979. The chronology that follows was established in this same interview. 16, "I'm not very proud," Author's telephone interview, July 30, 1978. 17, "Herbert feels that Blassingame," Author's telephone interview, Sept. 4, 1979. 17, "I wasn't interested," Author's interview, Feb. 27, 1978. 17, "We recognized early on," Author's telephone interview June 21, 1979. 18, "Those wonderful people," Author's interview, Feb. 27, 1978. 18, "It was a relationship," Author's interview with Ralph Slattery, Santa Rosa, Calif, March 15, 1978. 18, "I don't think," Ibid. 19, "Because of his background in philosophy," Author's interview, Feb. 27, 1978. 19, "The Slatterys also introduced," Ibid. 19, "One interest she shared," Author's interview with Ralph Slattery. 19, "science fiction was going to be," Author's interview, May 28, 1979. 20, "Bureaucracy has," Looking for Something? in The Book of Frank Herbert (New York: DAW Books, 1973), p. 79. 21, "Herbert does recall," Author's interview, Feb. 19, 1979. 21, "While in the Navy," Author's telephone interview with Jack Vance, March 1978. 34, "retired Naval officer," A copy of this letter is available at Fullerton. 34, "Undersea Riches," Author's interview, Feb. 19, 1979. A copy of the article is available at Fullerton. 35, "got him a seat," Author's interview, Feb. 18, 1979. 35, "In overt acknowledgment," Arthur C. Clarke, Profiles of the Future, (New York: Bantam Books, 1964), p. 35. 36, "a psychosis is not a disease," Thomas Szasz, in "Nobody Should Decide Who Goes to the Mental Hospital: Dr. Thomas Szasz talking with Coy. Jerry Brown and Dr. Lou Simpson, CoEvolution Quarterly, pp. 59–60. 38, "It began with a concept," Liner notes, Dune: The Banquet Scene. 39, "I had far too much," Unpublished interview with Frank and Beverly Herbert by Willis McNelly, Fairfax, Calif., Feb. 3, 1969. 39, "growth is limited," Paul B. Sears, Where There Is Life, p. 60. 40, "set a planet," "Building Worlds," a panel discussion with Frank Herbert, Joan Vinge, and Hal Clement, at Boskone XVI Science Fiction Convention, Boston, Mass., Feb. 18, 1979. 40, "Herbert 'assumed that'," Ibid. 41, "the primitives of the Kalahari," Unpublished interview by MeNelly. 42, "If you want to give the reader," Author's interview, Feb. 27, 1978. 43, "I decided to put the two together," Unpublished interview by MeNelly. 43, "a new 'avatar' for the Arabs," Ibid. 43, "It might become the new banner," Liner notes, Dune: The Banquet Scene. 45, "Feudalism is a natural condition," Unpublished interview by MeNelly. 45, "You gain insights," Liner notes, Dune: The Banquet Scene. 52, "So the next war," Herbert, "Cease Fire," Astounding Science Fiction, January 1958, p. 66. 53, "It isn't the ideas that make," Herbert, "Men on Other Planets," in The Craft of Science Fiction, ed. Reginald Bretnor (New York: Harper & Row, 1976), p. 131. 54, "The stories that are remembered," Unpublished interview by MeNelly. 54, "I wanted a sense," Author's interview, Feb. 27, 1978. 55, "The highest function of science," Sears, Where There Is Life, (New York:	Dell Publishing, 1970) p. 105. 55, "Respect for truth," Ibid., p. 174. 55, "Wisdom of the race," Ibid., p. 25. 55, "the sound of a passage," Author's interview, Feb. 27, 1978. Ibid. 55, "crucial passages as poetry," Ibid. 56, "It's a coital rhythm," Unpublished interview by MeNelly. 56, "When you sit down," Author's interview, Feb. 18, 1979. 57, "'to dry dead fuel'," Thomas Carlyle, Heroes, Hero Worship, and the Heroic in History (1841), (New York: A. L. Burt, ca. 1910), p. 15. 58, "'Prominent in 2068'," Herbert, "2068 AD." San Francisco Sunday Examiner & Chronicle, "California Living" section, July 28, 1968, p. 16. 58, "A feverish patient," For this observation I am indebted to a talk by Philip Slater. 58, "idiot-savants," Herbert notes (private communication) that his grandmother, an unlettered Kentucky hillwoman, had such a mathematical gift, and used to entertain the children with it. She was the original for Herbert's mentat idea. 59, "almost universally… demonstrate," Herbert, "Listening to the Left Hand," Harper's Magazine, December 1973, p. 92. 60, "he even worked as a 'ghostwriter'," Author's interview, Feb. 27, 1978. 61, "'language' of nonverbal perception," For the concept of a nonverbal language, I am indebted to George Simon. Cf. George Simon, Notebooks, 1965–73, ed., with commentary, by Timothy O'Reilly (Watertown, Mass. : Summer Publishers, 1976). 61, "'we do it all the time'," Unpublished interview by McNelly. 65, "'As you bring a focus'," Author's interview, Feb. 18, 1979. 71, "twin science," Sears, Where There Is Life, p. 61. 71, "'the Prolific would cease," William Blake, The Marriage of Heaven and Hell in Complete Writings, ed. Geoffrey Keynes (Oxford: Oxford University Press, 1971), p. 155. 77, "'self-development'," Unpublished interview by MeNelly. 78, "The many faces of melange," The following account is taken from an interview by Ted Jennings, Boston, Mass., Feb. 19, 1978. 78, "'the peyote religion helped'," James S. Slotkin, The Peyote Religion (Glencoe, Ill.: The Free Press, 1956), quoted in Richard E. Schultes, "Hallucinogens in the Western Hemisphere," in Flesh of the Gods, ed. Peter T. Furst (New York: Frederick Praeger, 1972), p. 14. 79, "al-Hasan's full name," William A. Emboden, Jr., "Ritual Use of Cannabis Sativa L.," in Flesh of the Gods, pp. 220–21. 79, "Nonpacifist psychedelic cults," Weston LaBarre, "Hallucinogens and the Origins of Religion" in Flesh of the Gods, p. 276, notes, for example, the use of the Red Bean by some of the Ghost Dance cultists in 1890. 79, "The Fremen rituals comprise," A brief commentary written by Frank Herbert for liner notes of Sandworms of Dune (New York: Caedmon Records, 1978) outlines the points discussed in this paragraph. 80, "Albert Lord compares," Author's telephone interview with Albert Lord, March 19, 1979. 80, "MeNelly has noted," Unpublished interview by MeNelly. 80, "Raglan describes," Lord Raglan, The Hero: A Study in Tradition, Myth, and Drama (London: Watts and Co., 1949), pp. 178–79. 81, "Albert Lord notes," Author's telephone interview with Albert Lord, March 19, 1979. 81, "Herbert's original interest in myth," From a talk given by Herbert, April 12, 1975, presumably in Fullerton. The tape, labeled "Science Fair" is available at Fullerton. 81, "the Jungian 'quest hero'," "Science Fair" talk. 81, "the unlocking and release again," Joseph Campbell, The Hero With A Thousand Faces, Bollingen Series XVII, Second Edition, (Princeton, N.J.: Princeton University Press, 1968), p. 40. The elements of the "monomyth" described in the following paragraphs are based on Campbell's work. 82, "one of the ways," Ibid., p. 51. 82, "a medicine man in Oaxaca," Author's telephone interview, May 28, 1979. 82, "I saw what was happening," Author's telephone interview, May 28, 1979. 83, "It's a dead-end street," Ibid. 83, "the doors of perception," This quote, from William Blake's Marriage of Heaven and Hell, was made famous as the title of Aldous Huxley's book describing his experience with mescaline: The Doors of Perception (New York: Harper and Brothers, 1954). 83, "To use such a substance," Liner notes, Sandworms of Dune. 85, "ecology could become," Liner notes, Dune: The Banquet Scene. 85, "History… is manipulated," "Men on Other Planets," pp. 128–29. 89, "female Jesuits," Author's interview, Feb. 27, 1978. 89, "My father really won," Ibid. 90, "Sitting with a girlfriend," Unpublished interview by McNelly. 91, "future management," "Men on Other Planets," p. 129. 92, "his father, who understood," Author's interview, Feb. 18, 1979. 93, "in order to grasp," Eugene Herrigel, The Method of Zen, ed. Hermann Tausend, trans. R.F.C. Hull (New York: Vintage Books, 1960), p. 91. 95, "certain kinds of changes," Author's interview, Feb. 18, 1979. 96, "Really it was," Author's interview, Feb. 27, 1978. 99, "The 'control of nature," Rachel Carson, Silent Spring, quoted in 'Will the Environment Defeat Mankind?" by Loins and Margery Milne, Harvard Magazine, Jan.–Feb. 1979, p. 20. 99, "One of the purposes," Unpublished interview by MeNelly. 99, "We have a very ancient," Herbert, The Godmakers (New York: Berkley Publishing, 1972), p. 108. 99, "hot-gospel ecologist," Author's interview, Feb. 18, 1979. 108, "the four Jungian types," Herbert, outline for Destination: Void, available at Fullerton. 109, "that particular being," Rollo May, "Contributions of Existential Psychology," in Existence, ed. R. May et al. (New York: Basic Books, 1958), p. 42. 110, "Ten Bulls," Paul Reps, Zen Flesh, Zen Bones (Garden City, N.Y.: Doubleday Anchor Books), pp. 131–55. 113, "In a public appearance," "Guest of Honor" speech, Boskone XVI. 114, "Herbert has cited Russia," Liner notes, Dune: The Banquet Scene. 114, "display the same arrogance," Ibid. 120, "The holders of power," "Crisis," p. 93. 121, "making demands," Author's interview, Feb. 18, 1979. 127, "as a batter," Author's interview, Feb. 27, 1978. 127, "You archaeologist," Herbert, "Carthage: Reflections of a Martian," in Mars, We Love You, ed. Jane Hipolito and Willis E. MeNelly (New York: Pyramid Books, 1973), p. 317. 129, "You've forgotten," Ibid., pp. 325–26. 131, "half my readers," Author's interview, Feb. 27, 1978. 138, "a sophisticated appreciation," "Crisis," p. 76. 139, "Both look to the ideal," Ibid. 139, "Santaroga is dangerously," Ibid., pp. 82–83. 140, "the names Dasein," I am indebted to a letter to Herbert from Stephen St. Clair for the first notice of the Heideggerian allusions; Herbert's debt to Jaspers was previously considered (though in different terms) in L. E. Stover, "Is Jaspers Beer Good For You?" Extrapolation, 17 (May 1976), pp. 160–67. 141, "Dasein is 'thrown'," The following account of Heidegger's use of dasein and sorge is based on Werner Brock, "An Account of Being and Time," in Martin Heidegger, Existence and Being (Chicago: Henry Regnery Co., 1970), pp. 11–116. 141, "We are destined," "Listening to the Left Hand," Harper's Magazine, Dec. 1973 p. 100. 142, "to instill," Author's interview, Feb. 27, 1978. 142, "what the eye," Ibid. 143, "The menace," Karl Jaspers, Way to Wisdom (New Haven, Conn.: Yale University Press, 1960), p. 21. 144, "The ultimate situations," Ibid., pp. 22–23. 145, "B. F. Skinner's attitude," Author's interview, Feb. 27, 1978. 145, "I deliberately took," Ibid. 146, "There is no single model," "Crisis," p. 93. 147, "The point of view," Author's interview, Feb. 27, 1978. 148, "Herbert explains," Author's interview, Feb. 18, 1979. 148, "It is by confusing," "Guest of Honor" speech, Boskone XVI. 151, "Dune Messiah was," Author's interview, Feb. 27, 1978. 152, "If 'Dune' is to be," Letter from John Campbell to Herbert, June 3, 1963. All of the following correspondence is available at Fullerton. 153, superheroes [are] disastrous," Liner notes, Dune: The Banquet Scene. 153, "Here's how I see," Letter from Herbert to Campbell, June 8, 1963. 153, "Now, consider Time," Ibid. 154, "The Time he saw," Ibid. 154, "There is always," Ibid. 156, "In outline," Letter from Campbell to Herbert, Aug. 12, 1968. 157, "As the father," Letter from Campbell to Herbert, June 3, 1963. 158, "The heroic self-consciousness," G. W. F. Hegel, The Philosophy of Right, quoted in Walter Kaufman, Tragedy and Philosophy, (New York: Doubleday) 1969, p. 245. 158, "not a tragic hero," Ibid., p. 235. 159, "According to E. R. Dodds," Ibid., p. 239n. 161, "the logical projection," Letter from Herbert to Campbell, June 8, 1963. 166, "I can state it for you," Author's interview, Feb. 27, 1978. 167, "The first step," Joseph Campbell, The Hero with a Thousand Faces, p. 17. 168, "schism in the soul," Ibid., pp. 16–17. 171, "Utopia is seen," Author's interview, Feb. 27, 1978. 172, "The only consistency," Ibid. 175, "For my part," Letter from Herbert to Campbell, June 8, 1963. 179, "the great machine," Herbert, Whipping Star (New York; Berkley Publishing Corp., 1972), p. 11. 179, "the need of obstructive," Herbert, "The Tactful Saboteur," in The Worlds of Frank Herbert (New York: Ace Books, 1971), p. 7. 180, "distrusted power," Herbert, "The ConSentiency and How It Got That Way," Galaxy, May 1977, p.6. 180-81, "five-gendered race," Ibid., p. 7. 184, "If you postulate," Author's interview, Feb. 27, 1978. 184, "sense of hierarchical intelligence," Ibid. 185, "I think I tried," Dune Messiah, p. 225. 186, "he wanted to turn," Ibid., p. 232. 186, "Before Satori," Author's interview, Feb. 18, 1979. 186, "the universe has no center," "Listening to the Left Hand," p. 100. See also Herbert, Destination: Void, p. 179. 187, "I had the place," Author's interview, February 27, 1978. 188, "In 'Dune'," Letter from Campbell to Herbert, August 12, 1968. 188, "a pot of message," The full significance of Herbert's wordplay becomes apparent here! 189, "Dune was set up," Author's interview, February 27,1978. 189, "Maybe the judgement," Author's interview, February 18,1979. 191, "If you understand," Herbert, The Jesus Incident, p. 202.